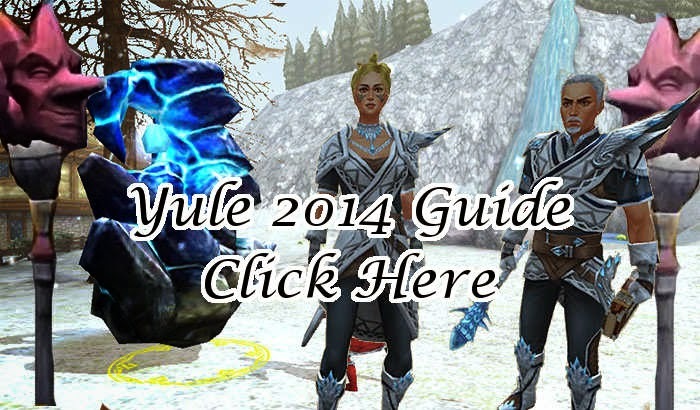 This is your guide to the Yule 2014 Winter event in Celtic Heroes that started December 8, 2014. 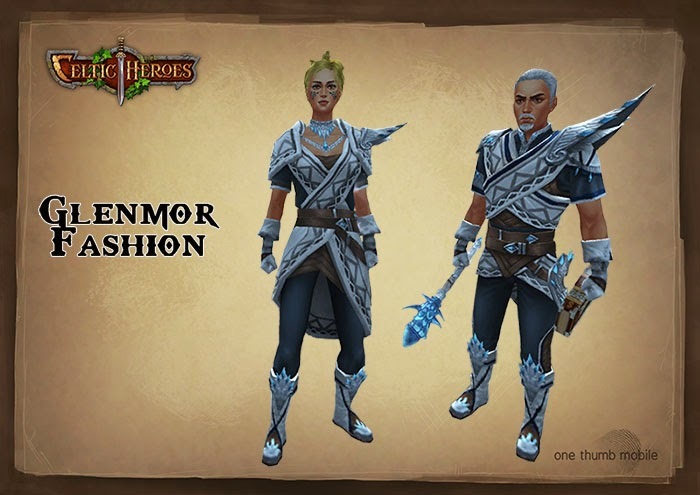 I'll be showing you new bosses, quests, chests, luxury items, mounts, fashion, and mobs along with maps and info about each part of the event. There are 4 Monolith/Obelisk bosses in this event. 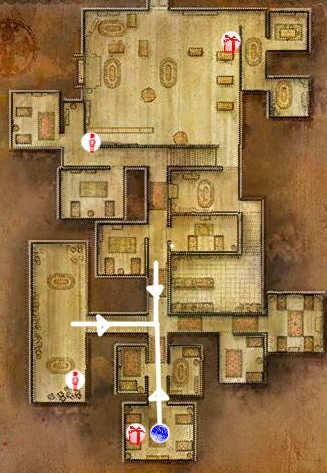 Each encounter is the same, but with more difficulty as the boss level gets higher. They come in 5* and 6* difficulties. The 5* Obelisks drop one item, and the 6* Monoliths drop 3 items. They respawn within 3-5 hours after they are killed. Taranis has hurled great Monoliths into the ground of Lir's Reach. These great shards of stone are possessed of a strange sentience all of their own, and will lash out with bolts of lightning at any who come near. I've heard it said that these Monoliths are made of Frostiron, and that when one of them is destroyed, the pieces of Frostiron left behind can be used as weapons... I wonder if that's true? Each Monolith is surrounded by 3 troll adds that have a lot of health and hit hard. Harder than the boss in fact. When one of them is empowered by the Power of Taranis, they are very difficult to defeat. They respawn in 4-5 minutes. 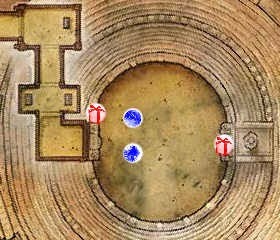 This quest starts in the castle to the left of the fountain by thetree at Kennis of the Snow. 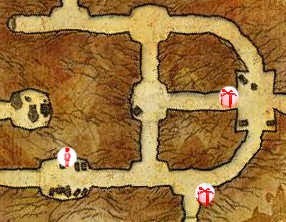 You will be gathering Red Yuletide Presents found in Lir's Reach, Crookback Hollow, the Tavern, Farcrag Castle, Dustwither Catacombs and the Arena. 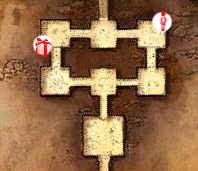 There are also rare purple presents, that when opened give you 10 red presents. The reward is a Top Hat, worn to celebrate the festive season. You also have the chance to get the sparkling variety of top hat, that has a sparkling effect. 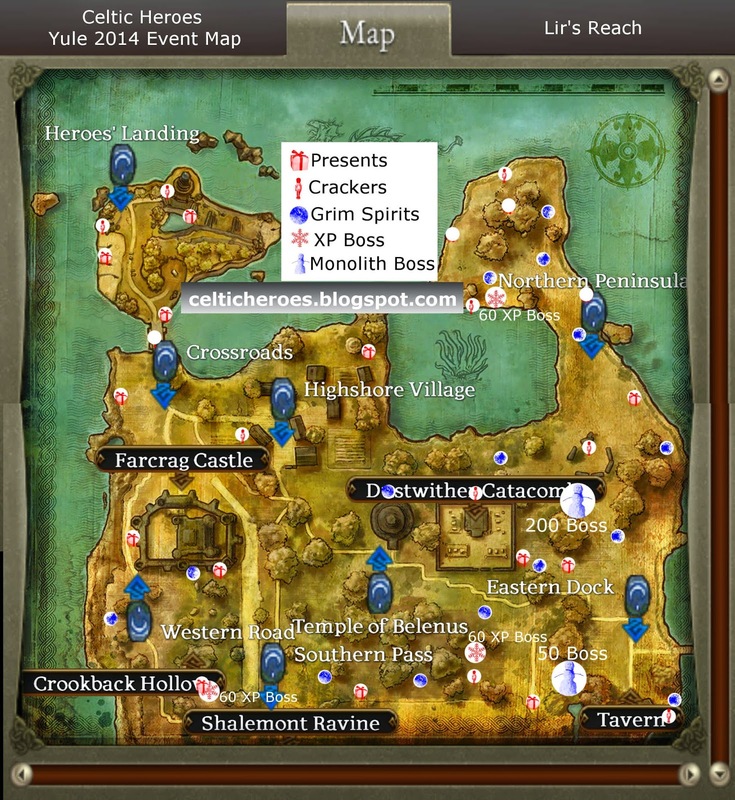 At the end of the quest, you will have turned in 2313 Red Yuletide Presents! This quest will have you killing Grim Wisps found in Lir's Reach, Crookback Hollow, the Tavern, Farcrag Castle, Dustwither Catacombs and the Arena. Once you loot 20 Iceheart Crystals from them, you can turn them in to Serena of the Ice to the left of the Castle Courtyard leystone for a Winterstave of a random color and rarity. You might even get one that sparkles! See the map above to find where the Grim Wisps spawn. Sprites come in level 20 from 1 to 5 stars. The more stars a sprite has the better possibility it has of dropping multiple Iceheart Crystals. There is also a level 190 sprite that spawns rarely, and will give you a decent amount of xp. 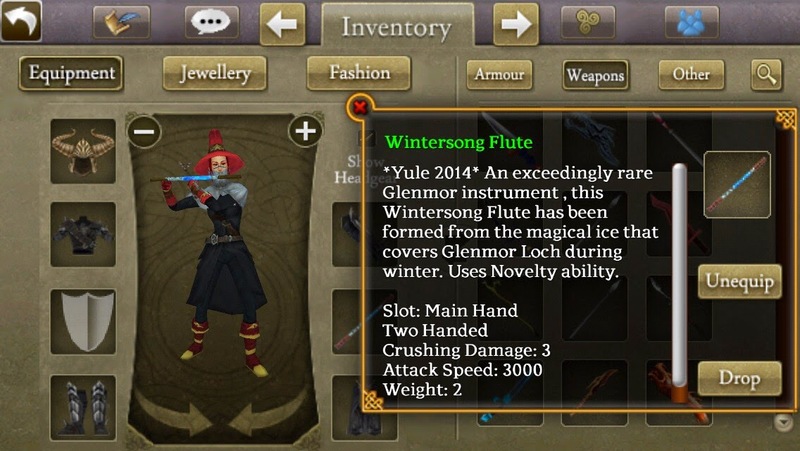 You can also rarely get instruments and mounts from the level 20 sprites. 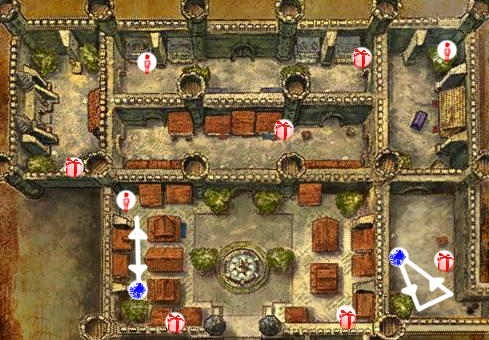 This quest starts at Jack Frost to the right of the fountain in the Castle Courtyard, and requires you to defeat 3 XP bosses, and loot one drop from each of their guards. The item drops come from the non-bow mobs. This quest is easily soloable. The mobs are very weak. The xp bosses spawn on a 30 minute timer. Ansgar of Glenmor has journeyed from the northern lands carrying jewellery and other items blessed with potent magic. 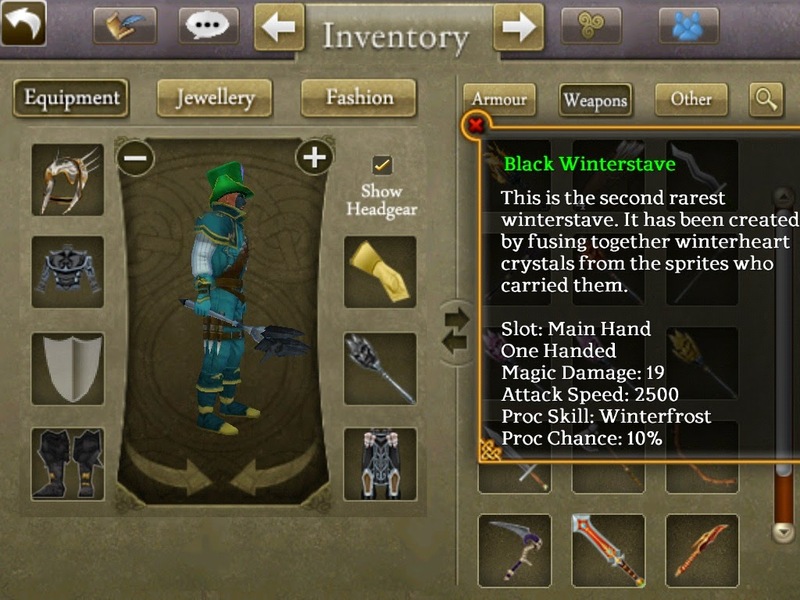 The luxury items he sells are among the most powerful seen in the Celtic lands, but do not tarry if you want to see what Ansgar has t osell - he will only be in Farcrag Castle during Yule! If you with to buy such items from Dolina, seek him out in Farcrag Castle, and hurry - when Yule draws to a close, he, to, will take his leave. 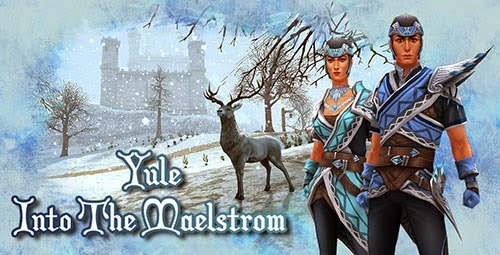 Don't wait around though, the Frostbound Mystery Chest is only available during the Yule 2014 event! Yule crackers can be found on the ground around Lir's Reach. These can be sold to shops for a good price. The rare ones are especially a good find! Check the map above to see where to find them. Bericus MacCroin at the Stonevale Farm. Deep in the Karpati Mountains upon their highest peak lay Rath Torrannach. The mighty fortress encased in a maelstrom, its rocky exterior blistered and blackened with a multitude of twisted scars where forked lightning had leapt from the clouds to scratch its surface. The raging storms meant that only the foolhardy would think to cross the high passes and of those only the keenest eye would be able to spot, let alone find, the entrance. The portal, sealed by thick black ice, had been barred to the outside world for centuries and held dark secrets which no man wished to uncover. The deep halls echoing with the sound of thunder lay desolate bar the movement of Boggan priests, tending to the vast tomes of their malevolent master. In the throne room Taranis sat, drinking in the energies that surrounded him and waiting… waiting oh so patiently for the world to turn and opportunity to fall into his lap. As the great door facing him opened a smile came to his lips as he saw the bloodied and battered prisoner being dragged in heavy chains between the Skur guards. A familiar face to all men. The Yulefather! Jack Frost pursed his lips as he put the finishing touches to his new creation. 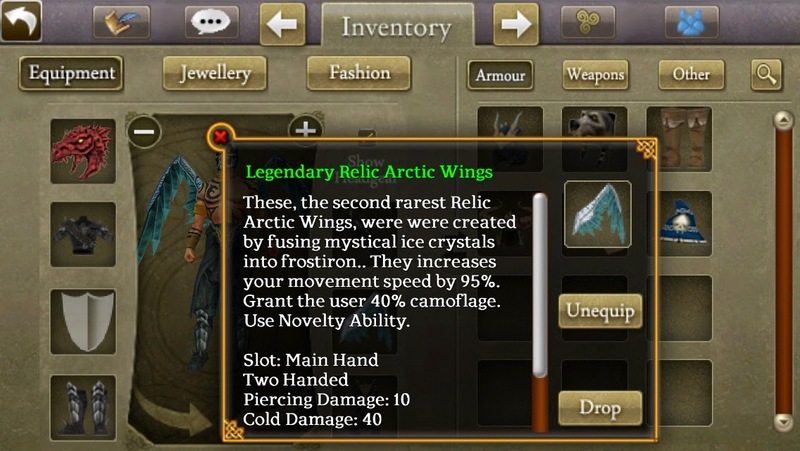 The fine frostiron twisted majestically around the mystical ice crystals to create wings of such grace that lesser mages would seethe in jealousy. The spirit of winter and passing time knew only too well why mankind had abandoned his harsh winters for the hope the Yulefather brought. The hope that Belenus would return and with him the rising sun, bringing life to the world and caused his icy landscape to recede. Yet hope was thin, the Yulefather was missing and the gates of Rath Torrannach had been flung open. The forces of Taranis had become the scourge of men and worse still, at their heart, vast sentinels of his own beloved frostiron had been corrupted by the evil god. Twisted into living Monoliths of destruction who would blast the unwary with lightning and ice. Mankind had abandoned him and yet he cared for them too and so, with a grumpy grunt, he stood from his work, gathered his forces and went forth to drive back the darkness. Hey iam zn of mabon ifound prince's cracker of yluetide the one u miss and its worth 10k on shop.